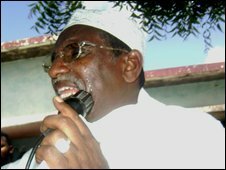 Gunmen in Somalia have killed the director of influential Radio Shabelle. 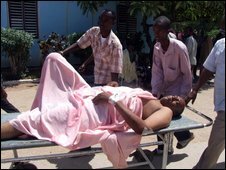 Moqtar Mohamed Hirabe was shot several times in the chest and head, one of his colleagues - who was injured in the attack in Mogadishu - said. The colleague, Ahmed Tajir, remains stable in hospital. Somalia is one of the most dangerous countries for journalists. The attack came amid uncertainty over the fate of Islamist opposition leader Sheikh Hassan Dahir Aweys. A pro-government militia claimed on Saturday that Mr Aweys had been killed - or seriously injured - during fierce battles for the town of Webho. A spokesman for his militia said he was still alive. And AFP news agency later said it had spoken to Mr Aweys who said he would make a media appearance on Monday. The United States says Sheikh Hassan Dahir Aweys is a terrorist with links to al-Qaeda. In April he returned to Somalia from exile and vowed to overthrow the government and impose a stricter version of Islamic law. Fighting between the opposition and pro government forces has been intense - close to 100,000 people have had to flee their homes over the past month. More than 120 people are reported to have died since Friday. Three civilians were killed early on Sunday in what appeared to be a failed attempt to bomb a police vehicle. Somalia has not had a functioning national government for 18 years. Journalists working for Radio Shabelle have often come under attack since the independent station began broadcasting in 2003. Hirabe, 48, is said to be its third journalist to be killed this year. Some reports suggest he may have been killed by members of Mr Aweys' militia, angered at the report that their leader had been killed - or injured. The latest spate of fighting began after the Sufi Ahlu Sunnah Wal Jama sect pledged to defend President Sheik Sharif Sheik Ahmed at a meeting of moderate Islamic leaders. A hardline Islamist alliance controls much of southern and central Somalia. Correspondents say the Sufi sect has been angered recently by the desecration of the graves of revered Sufi leaders by the al-Shabab group which follows the strict Saudi Arabian-inspired Wahabi branch of Islam. A spokesman for al-Shabab, which is accused of links to al-Qaeda, said its forces were in control of Webho - but this was denied by Ahlu Sunnah Wal Jama. The town has changed hands several times in recent weeks. President Ahmed is a moderate Islamist, who was installed in January after a UN-brokered peace deal.